Set Sail on the USS Riverside! - Enjoy a relaxing, fully narrated cruise, detailing the history of this region and the Colorado River. - The USS Riverside Boat Office is located on the Riverwalk level of the Casino, directly across from where the USS Riverside is docked. - The USS Riverside is the only cruise boat that is able to go under the Laughlin Bridge - taking you up to the Davis Dam! - For your comfort, the USS Riverside boasts a shaded upper deck & climate-controlled lower deck for your comfort. We offer two additional Cruise times on Saturday: 6:30 PM & 8:30 PM – The Sunsets are amazing! The USS Riverside is the only cruise boat that is able to go under the Laughlin Bridge - taking you up to the Davis Dam! Refreshments: Beer, wine, mixed drinks, soft drinks and snacks are available for sale during each tour. Facilities (Restrooms) are available on the USS Riverside. 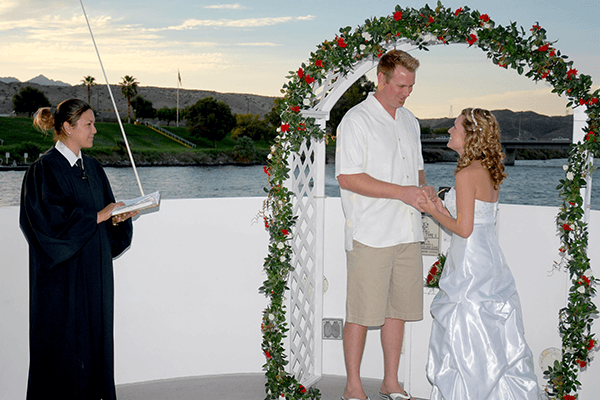 The USS Riverside is available for Weddings, Corporate Functions, Family Functions, Group Entertainment. Please Note: All USS Riverside tours are based upon availability; times subject to change. The Riverside Resort Hotel & Casino is not responsible for low river levels, high river levels, engine malfunctions or dry dock time. Please contact the USS Riverside Wedding / Event Coordinator for more information.